The biggest, brightest Bejeweled® ever! Discover all-new ways to play the world's #1 puzzle game. Find your perfect match with 8 breathtaking game modes that meet all your moods - ease into Classic Bejeweled for cascades of fun, journey through 40 challenging Quest puzzles, charge into the electrifying Lightning for non-stop action, and tailor your experience in Zen for a revolutionary new way to relax. 8 game modes: Find a perfect match for every mood. Earn up to 65 Badges: Prove your multifaceted skills. 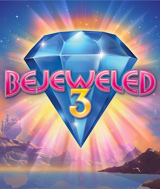 High-definition graphics: Bejeweled is more sparkling than ever. New ultra-smooth action: Make multiple matches while new gems fall into place. Comments: This is the best of the bejeweled series. With 8 differnt versions to play, there is a twist for everyone who enjoys match 3 games.